By far THE BEST President, Srilanka ever had. DBW shines for Generations to come. This reproduction is a timely reminder of the quirky nature of national, Sinhala and Tamil politics. When there is a solution in sight or a possible way out, there is always someone to sabotage it. An interesting phenomenon for research a, which may provide answers to our national conundrum. One aspect of the Wijetunge government that is seldom spoken about is that it facilitated the exit of Tamils with false documents through the airport, when the right price was paid, The N.U. 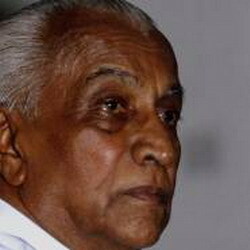 Jayawardene advice that the a Tamils must be made a manageable minority was implemented and the Tamils paid to give it effect. The Tamils thought they were being clever, while many in authority and played the intermediary role, became rich. In the case if the intermediaries (agents) , it was a rag to riches story. Wijetunge made it easy to export the Tamils and hence the Tamil problem, by helping many to earn the fat buck in the deal. The Tamils became a willing export commodity! The nature of the Premadasa has been summarised well. What did young Sajit, learn from his father? To follow his footsteps or be different? I know as a young returnee from the UK, he was apprenticed to many government servants at the helm under President Premadasa. What did he learn? To see merits in his father’s methods or otherwise? These are questions that have to seek answers for, before considering Sajit Premadasa as an alternative to Ranil Wickremasinghe.